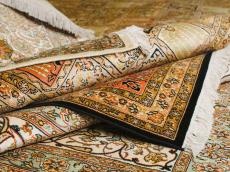 The DOMOTEX 2019 exhibition was recently held in Hanover, Germany, where a delegation from Turkmenistan’s Ministry of Textile Industry took part, Trend reports referring to the Turkmen Foreign Ministry. The organizer of the event, which was attended by about 1,400 organizations from more than 60 countries, is Deutsche Messe AG, an exhibition and fair company. A series of meetings with interested companies and representatives of the business community were held on the margins of the exhibition, where opportunities for cooperation to supply carpets made in Turkmenistan to international markets were discussed. One of the advantages of the Turkmen carpets is their high density, which ranges from 200,000 to 400,000 or more nodes per square meter, making the carpets’ ornaments clear and expressive.